Years ago, a member of the congregation I was serving gave me a beautiful plant on the anniversary of his wife's death. His wife was a master gardener and was well known for her ability to grow and care for rare orchids. Therefore, it seemed fitting and touching when he came to my office that day with an orchid in hand for me. He said he wanted to thank me for all the time that I had spent with his wife while she was sick at home and for the comfort that I had provided her family and friends when she died. I shared with him that I greatly admired the orchids she kept in her home. I knew that every time I looked at that orchid, I would be reminded of her. Yet, I was nervous about receiving this plant. I was afraid that I would not be able to take care of it in the way that I knew was needed. Yet, he assured me that I would have no problem. What he did not tell me was how much attention it would receive when people came into my office. Gardeners and plant people often commented on it and asked me questions about the specifics of the orchid and its care. When someone asked me what kind of orchid it was...I was tempted to say that of the 1,000 different species of the Dendrobium Phalaenopsis orchid, which mine appeared to be, I knew exactly the type and proper name of my orchid. When someone asked if the reason I decided to keep the orchid on the shelf on my desk instead of a windowsill because I knew how important it was to keep the plant cool...I was tempted to say that I knew my orchid needed to be in a spot that was 75 to 80 degrees in the day and 50 to 55 degrees in the evening. Thus, I always made sure the temperature in my office was always suitable for the flower's health and well being. When someone asked how I watered my orchid because they knew it was important to keep the soil moist, but not soggy...I was tempted to share with them tips on the best way to properly water an orchid, such as placing a few ice cubes on the outer edges of the pot once a week. By letting the ice cubes melt into the soil, the water would spread evenly and slowly. Finally, when someone would comment they had heard how difficult it was to take care of orchids and were impressed at how I was able to have such a perfect flower...I was tempted to say that I did know how difficult it was to take care of it and I had dedicated a good deal of time and effort in doing so. However, I could not say those things. If I had, not only would I be lying, but I would have been a fraud. You see, what I realized after the orchid had been in my office for two weeks and I had forgotten to water it was that it was actually an artificial plant. It was not a living plant. It did not produce new blooms, new growth, or new oxygen to the atmosphere. Its only value was it was pretty and decorative. 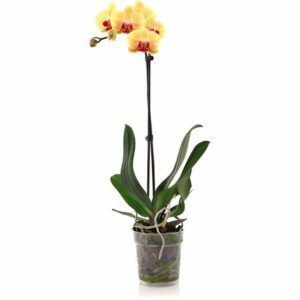 When I think of that artificial orchid, I think of the writer of the book of James who essentially says that if we in the Church are not producing new blooms, new growth, and oxygen for others, then we do not have a faith that is real and alive. "What good is it, my brothers and sisters, if you say you have faith but do not have works? Can faith save you? If a brother or sister is naked and lacks daily food, and one of you says to them, "Go in peace; keep warm and eat your fill," and yet you do not supply their bodily needs, what is the good of that? So faith by itself, if it has no works, is dead." If our faith is only something that we sing about, preach about, pray about and speak about it...then it is only artificial. It might be decorative, pleasing, and pretty to us, but it is not life-giving to others. My prayer for the Church is that our faith is a living, growing faith that gives life, breath, and grace to those who need it most.